A Rust Belt synagogue 'runs out of people' and gathers to bury its past. It was a frigid 10 degrees on Sunday, the last day of 2017, but some 20 people gathered at Congregation Tifereth Israel’s cemetery in a city of 22,000 on the Ohio border. A blue tent and folding chairs had been set up for attendees, and a pit in the ground had been opened. No hearse would be arriving at this unusual burial, which was not for a person. Still, a few attendees choked up when they greeted each other with hugs and wiped tears from their cheeks. This was a subdued sort of mourning because no friend or relative had been taken from their midst. Nor was the “death” a sudden one. Indeed, the congregation had been preparing for this day for years. Deep below, the hole was lined with cardboard boxes containing yahrtzeit plaques, tallit prayer shawls and other ritual items that cemetery caretakers had carefully lowered in a few days before. The mourners had come to bury, in a sense, their synagogue. Congregation Tifereth Israel was founded nearly 125 years ago. In 1894, synagogue members lived in a busy town with a suddenly booming economy. Linked first to the canal system and later to the railroad, the population of New Castle, Pennsylvania, swelled at the turn of the 20th century as the town’s manufacturing base grew. Tin plate and paper mills and steel and ceramic factories brought great prosperity to the region. Ancillary businesses cropped up to support the growing population. Many of these – drug stores, department stores, furniture stores, groceries – were owned by New Castle’s Jewish residents. Bright eyed and lively, Bruce Waldman told me that he was born in New Castle in 1942, and that one day he will be buried here. His plot in the Tifereth Israel cemetery is already designated. Waldman’s father also was a New Castle native and is buried here. His grandfather, who was among the New Castle Jewish community founders, had emigrated from Eastern Europe via Pittsburgh, 50 miles south. When Waldman was a boy in the 1950s, the town’s population reached its peak of 48,834. At the time, the Jewish community boasted two synagogues, the Reform Temple Israel joining Tifereth Israel, with 300 to 400 active families in total. As the economy changed in the 1960s, New Castle’s population dwindled, along with so many other Rust Belt cities. By 1990, the numbers had dipped to 28,334 residents; today the number stands at about 23,000. Those looking for a more robust Jewish community for their children went elsewhere. Others simply moved away for better economic opportunities. Waldman’s two sons left for college and never returned. One now lives in Sydney, Australia, and the other in New York. Faced with shrinking numbers, the town’s two Jewish congregations merged in 1997. The newly named Temple Hadar Israel operated out of the Tifereth Israel building and remained affiliated with the Conservative movement. The consolidation helped retain some vibrancy. Still, as the population continued to age and young people became scarce, it became difficult to gather a minyan, or quorum, for Shabbat services. Members began to consider the possibility of winding down synagogue operations. About five years ago, Temple Hadar Israel members reached out to the Jewish Community Legacy Project, or JCLP, an organization that works with small, dwindling congregations to help insure their legacies. A partnership of the Jewish federations, the Reform and Conservative movements, and two national Jewish historical societies, the JCLP helps congregations preserve historic documents, catalog and dispose of ritual objects, create oral histories and divvy up assets. JCLP says it has worked with 50 such communities and identified 100 more that meet its criteria for assistance. Bernstine cares deeply about the congregation, which helped raise him after he lost his mother to cancer when he was 9 years old. His loyalty, though, never got in the way of his pragmatism. Bernstine said his goal was to have the congregation face its own end in a “respectful manner,” to be “in control of our own destiny.” Step by step the synagogue divested of its material assets. The congregants sold the building, with the agreement that they could rent back space from the new owners and continue to meet in the sanctuary. They donated their synagogue records, photographs and a few ritual items to the Rauh Jewish History Archives at the Heinz History Center in Pittsburgh, the Klau Library of Hebrew Union College-Jewish Institute of Religion and the Lawrence County Historical Society. The yahrtzeit plaques posed a more delicate problem because each of them has a connection to a particular person. Members who still live in New Castle claimed their family members’, and efforts were made to locate relatives of those who grew up in New Castle but were now scattered across the country. Whoever took control had to face the question of what to do with the plaques. “I am not going to throw them out, but I don’t want them hanging in my living room,” one woman told me, speaking about her parents’ plaques. She placed them in a box and keeps them in her basement. Alan Samuels took his parents’ plaques to the cemetery and affixed them into their headstones. Temple Hadar’s nine Torah scrolls went to congregations across the world to help those struggling to get by and reinvigorate others. One went to the new "progressive" congregation Beit Centrum Ki Tov in Warsaw and another was sent to a tiny community in Indonesia that recently revived its connection to the Jewish world. One went to a Houston congregation that suffered damage in the recent floods. Other recipients included a "Reconstructionist" congregation in Cleveland, a Reform temple in South Carolina and three summer camps. Next month, the last remaining scroll will be donated to the Hillel Jewish University Center of Pittsburgh amid a weekend of festivities. Even with the great care to find a home for each ritual object, some remained orphaned. Among them were prayer books, prayer shawls, curtains for the Torah ark and many unclaimed yahrtzeit plaques. Rather than dispose of them, a burial was planned. On Dec. 30, the members of Temple Hadar Israel held prayer services in their sanctuary for the last time. Every person was called to recite a blessing during the Torah reading -- an honor known as aliyah -- and people offered reflections at the final kiddush lunch. 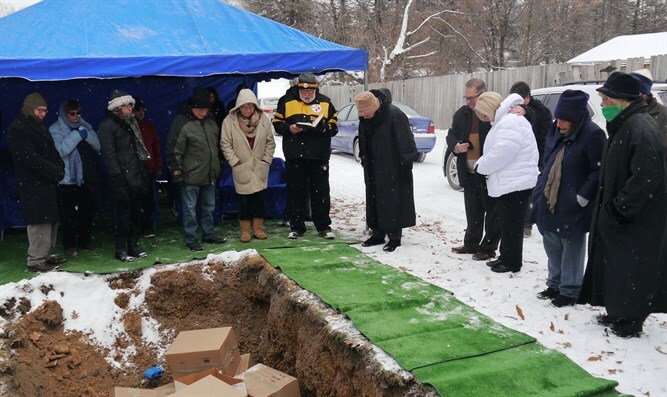 The following day, congregants drove through the snowy cemetery grounds to the pit that held the last of their items. Their part-time rabbi, Howard Stein of Pittsburgh, was not in attendance, as his own father had passed away the day before. I attended as part of my research into what congregations do with their material objects when they merge, downsize or shut down. A few weeks prior, Stein told me that his plan was to conduct the ceremony like a funeral. In his absence, the event was brief, ad hoc and raw. One man read a passage about the Cairo geniza, a famed storehouse of centuries of damaged Jewish texts and ritual objects. Another man spoke about honoring the word of God in the same way that we honor a deceased person. The ground was too cold to shovel dirt. Instead, congregants took hold of a few final items – including the prayer books that had been used for Shabbat services the day before -- and together tossed them into the hole. To close the ceremony, Eric Lidji, director of the Rauh Jewish History Program and Archives, offered a few words of reflection on the verse from Ecclesiastes: “There is a time for scattering stones and a time for gathering stones.” Although Temple Hadar Israel has disbanded, Lidji explained, its stones have been gathered in the archives and here, too, in the cemetery. As Lidji concluded, someone in the huddled group spoke up. “Shall we say Kaddish?” this person asked, referring to the Mourner's Prayer. Their prayer books were in the pit, but everyone seemed to know the words by heart. They recited the prayer together, memorializing their shared past, their last act as a congregation. Final hugs were exchanged as the group dispersed with lowered heads. They returned to their cars, driving in a procession up the snowy hill and out of the cemetery. In November, the last 15 members of the Auburn, Maine, Beth Abraham Synagogue sold the building to a developer. Beth Abraham has not had a rabbi for several years, and only opened for three days each year to worship on the High Holidays. Founded in 1902, three years after the first Jewish family settled in New Auburn, it received its iconic brick building in 1934. Meanwhile, Congregation Anshei Sfard synagogue in Louisville, Kentucky - the only Orthodox synagogue and mikvah (ritual bath) in the entire state - may face a similar fate if the developer it was sold to last year is allowed to re-zone the land. Louisiville's synagogue, built in the early twentieth century by the city's then-vibrant Jewish community, sits right next to its Jewish Community Center, in the heart of the city's Jewish community. If the planned condominiums are allowed to be built, wealthy KKK supporters may move in, posing a threat to the local Jews. Louisville was home to Rabbi Charles Ber Chavel, who led its community for several years. Rabbi Aryeh Kaplan, as well, lived in the community for approximately a decade. 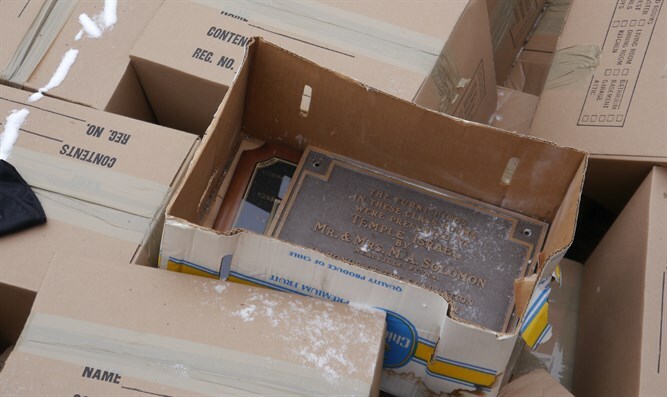 A hole at the cemetery was lined with cardboard boxes containing yahrtzeit plaques, tallit prayer shawls and other ritual items from the once vibrant synagogues in New Castle that merged to form Hadar Israel.